Beloved by Americans, sweet potatoes are a relatively recent addition to the French culinary repertoire. This simple recipe makes a purée that may be served as a side dish or as the centerpiece of a vegetarian meal. 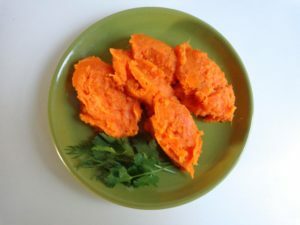 As sweet potatoes are now available year round, this dish may be served in any season — but it is perhaps best in the autumn. Peel the sweet potatoes and remove any dark spots. Slice into thumb-width rounds. Bring a large pot of water to a boil. Add the salt. Add the sweet potatoes. Cook until very tender, 20-30 minutes. Tip the potatoes into a colander. Drain very thoroughly. Place the potatoes in a clean pot. Mash with a fork. Add the butter and stir to blend. Grind in some black pepper. Taste and add more salt if necessary. Reheat gently. Serves 2-3. For more zing, add a crushed cayenne pepper to the potatoes. Or you can add some chopped fresh herbs just before serving — dill, cilantro or parsley.